We pick up, where we left off last issue, with the young heroes stuck on Gem World. Robin and Amethyst ambush the rest of Amethyst's contemporaries. Wonder Girl, Jinny Hex and Teen Lantern try to figure out what happened and here they are, as Wonder Girl flashes back to a visit she recently had from her grandfather Zeus. In order to figure out what is going on, the three young heroines take to the skies, where they fly into Robin and Amethyst. When Amethyst explains to them that they are on Gem World, they are interrupted by Lord Opal, who proclaims that he is the ruler of Gem World. Story - 3: As excited as I was when this title was announced, and when I read the first issue, I felt somewhat deflated after reading this one. It's unfair to say that I didn't enjoy it, as it didn't live up to my own expectations, but that's exactly what it was. I thought that we would get more of a continuation of the story, but what we really got is a month's wait for essentially four scenes... And no Conner! With our young heroes on Gem World, we only really got a minor moment of them coming together to work things out, and a flash back of one afternoon with Wonder Girl. I was expecting something a little more, as to why Cassie has been missing from the DCU, since Rebirth essentially, only to find that she has been "hero-ing," only not really being recognized by anyone anymore. Her reunion with her Grandfather Zeus was also a little bit of a let-down, as to how vague it was. Cassie is now heir to the Gods and Grand Daughter to Zeus, yet before she was Zeus' daughter, one of many children he sired over millennia. I know that Bendis plays the long game, but this method of storytelling could have one lose interest very easily. Also another sore spot would have to be the throwaway use of Despero this issue. Despero is a DC heavyweight, the likes that can take on the entire Justice League, and we see him being thwarted so easily by Wonder Girl, at a High School of all places. This sort of stuff annoys me as a fan, because I have seen it done countless times with Superman, when weaker and even lesser known characters can knock him for a loop, just to put over the character, to make them a credible threat. This exact thing is done with Despero, who is essentially relegated to "goon/thug" status here. A Toyman contraption or even someone like Solomon Grundy or Blockbuster would have worked better in my opinion. When we water down characters like Despero, Mongul even Darkseid, they become less of a threat and more of a joke. With that being said, this does not mean that I can write better than Bendis, it's just my personal feelings toward the use or misuse of certain characters. 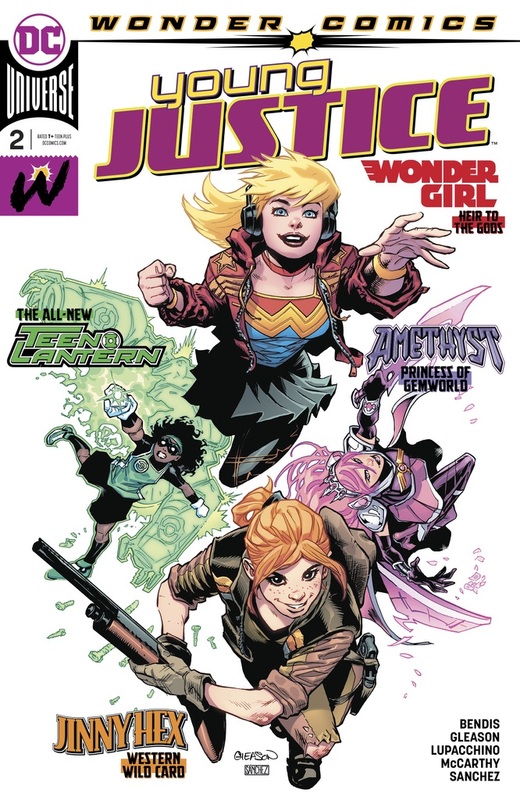 As many of you know, I don't like to be too negative in my reviews, and there were some elements I enjoyed in this issue, for instance the girls getting to know one another, Robin riding in on Amethyst's horse and Teen Lantern struggling with her powers. Sadly the negatives over powered the positives for me this issue. Next issue we are promised the telling of what happened with Conner Kent. I just hope that it is better told than Wonder Girl's tale. 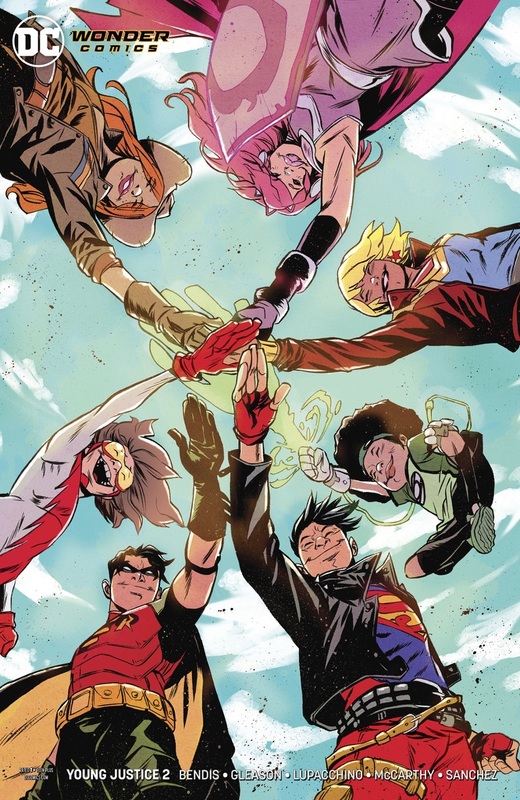 Art - 5: Patrick Gleason seems like a perfect match for this title, his art works so well with youthful characters, and he is able to portray them as such. There is a good mix of cartoonish and classic art that balances out the tone that this book is going for and also needs. Surprisingly enough, it's the moments on Gem World with Wonder Girl, Jinny Hex and Teen Lantern that I enjoyed the most. They felt the most personal as the three characters get acquainted and figure out their next move. I found the art a lot more accessible this issue than that of the first, even though I enjoyed that quite a bit also. Alejandro Sanchez did a fantastic job coloring the issue, injecting life into each page. I especially enjoyed the tonal shifts from Gem World to the flashbacks on Earth with Wonder Girl. The way he lights each page, highlighting powers and the environment is a great example of his excellence in his medium. Cover Art - 4: Gleason's cover is good, but just didn't leave me excited for this issue. There was a sense of wonder that it just lacked, which is ironic seeing as it features Wonder Girl, and is part of the Wonder Comics imprint. Maybe the lack of background is what it was. I did like the "roll call" on the cover though. Variant Cover Art - 3: Though I love Sanford Green's art, and the perspective is wonderful, the faces of the characters just looked really off, especially Superboy.